Connor grew up in around the ocean and rocks of Southern California. 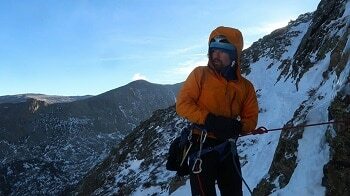 After a few years of rock climbing he was introduced to the mountains of the Sierra Nevada. His love for the mountains was realized following a winter ascent of Mt. Whitney. He found that challenging his physical and mental boundaries made him feel alive and at home atop these snow covered peaks. Connor then left the warmth of Southern California and moved to Colorado where he spent his time ice and mixed climbing. Through climbing Connor has found happiness and contentment, his focus is sharing this experience with others. Loved it. Much better than my Brand X Denali expedition last year I attribute this to perhaps higher screening standards with AAI. Also more menu diversity with AAI which was appreciated.